Come join us for a service activity at Maunaʻala on Saturday, May 14 from 9:00am – 12:00pm. Values and Traditions of our ancestors of old. Utilize your gardening and landscaping skills to help beautify this historical site. Volunteers will be providing general landscaping assistance by weeding, planting and raking. Here’s an interesting summer enrichment opportunity for those of our Scholars who love spending time with a good book. The Summer Academy at St. John’s College is a pre-college, residential summer program that offers high school students ages 15 to 18 an exceptional learning experience. Organized in one-week sessions, students read and discuss texts from the Western canon in small classes guided by St. John’s renowned faculty. Students live in dormitories and share campus amenities as well as enjoy off-campus excursions to celebrated sites. Sessions are hosted on both St. John’s campus locations, in Annapolis, MD and Santa Fe, NM. Students may spend a week or more on both campuses. For more information or to apply, visit their website. The deadline to apply is May 15. Honolulu Automotive Employers are demanding top qualified technicians with the knowledge and the ability to work on today’s modern and highly sophisticated automobiles. The fact is that Hawaii has hundreds of family wage jobs available for driven individuals that wish to care for customer vehicles. In a strong or poor economy, vehicles require maintenance and repair. 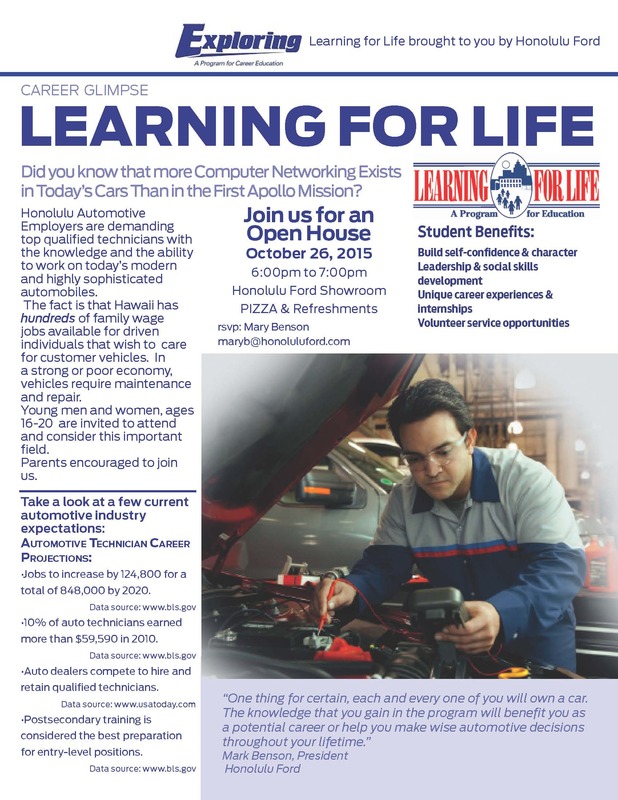 Honolulu Ford is hosting an information session on October 26 from 6pm-7pm. Young men and women, ages 16-20 are invited to attend and consider this important field and learn about the opportunities available to them. Parents are also encouraged to attend with their child. Please see the attached flyer for additional information; you can RSVP to attend by emailing Mary Benson at Honolulu Ford at maryb@honoluluford.com. Head over to the College Peek tab to take a look at our latest peek … Point Loma Nazarene University in San Diego!